Yeah people I got a new phone to play around with and use. That’s what you get for loving gadgets. 😛 Anyway, I was eyeing this phone and is slide couterpart (Nokia E66) when I was still in China but for some odd strange reason I wasn’t able to get it in Beijing, they were selling it in Hong Kong though but I didn’t go there during my one year stay in China. Oh well, it would have been nice to have Chinese characters on it like I have on my Nokia 6300. I did a firmware upgrade in BJ for that. There probable will be a way to get Chinese on it but that means hacking and tweaking my E71 which would mean losing my warrenty. So that is not gonna happen anytime soon, unless I go to China anytime soon and get an official upgrade in a Nokia store there. Here a picture of the Nokia E71 for the people that are wondering how it looks like. 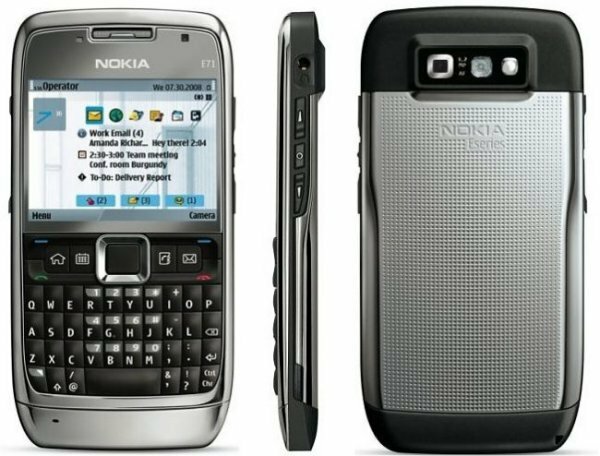 For the specs, just go to the Nokia website and search for it, if you want a phone with the same spec but without the qwerty keypad, look up the Nokia E66. Same phone but in a slide version. Anyway, I love this phone. 🙂 Qwerty in a small package, metal casing, all the funtionality I want and might need. Man the only thing that might be an upgrade is something like the SonyEricsson X1 aka Xperia but then with symbian instead of WM (Windows Mobile). For the people that remember, I also have a HTC Tytn which I still use but less frequently. I liked the HTC Tytn basically because it gave me a touchscreen and qwerty keypad. I needed a PDA with phone capabilities, but I dislike WM because it’s not really made with the thought of it being used as a phone. As a PDA it works very well, I used to browse, mail, use word and navigate (Tomtom) with it but as a phone it’s not as intuitive imho. The UI (User Interface) is something that can be drastically improved, look at the various software that has been made to make WM more usable as a phone. Two examples of these are HTC Touchflow & SBP Mobile Shell. Specially all the software from SPB made WM that much better in terms of usability. Microsoft GET you act together and start thinking of USABILITY!!! And not just on frigging eye candy!!! Hope this will get better with WM7 but I’m highly doubting it, but who knows. Microsoft might surprise me, which I really hope they do at the end of next year when WM7 should be released. WM is kind of a mixed bag in imho and has it pros and definately it’s cons, just like Symbian for that matter I think. But anyway both have their merits and I will probably won’t be using my HTC Tytn anymore but as a back up should something happen to my E71 (which I doubt, but you never know). After fiddling around and customizing my E71 I must say that I am really impressed with what Nokia pulled off with the follow up of the E60 & E61i (the previous candybar qwerty business smartphones from Nokia). The only thing I need to do and find is proper navigation software, because Tomtom stopped releasing their sofware after version 6 for symbian and to get that working with the internal GPS will involve quite some tweaking and fiddling around. Which I’m not gonna do, also because the maps for version 6 are probably outdated which would mean I might end up in the middle of nowhere. 😛 Guess I will have to take a look at Rout66, Navigon and all the other players on the market that sell their software for the E71. Great phone! I have a E71 too. I’m in Shanghai. Many E71 users I can see in the subway everyday. Well I was just searching on Google for some videos and songs of my favorite singers and just came across your blog, generally I just visit blogs and retrieve my required information but this time the useful information that you posted in this post compelled me to reply here and appreciate your good work. I just bookmarked your blog :).